Children thrive on inspiration. Actually, everyone is touched by words, good or bad. Think about your own experiences and how words have affected your direction in life. I remember when I was going through a difficult divorce and feeling terribly vulnerable. My wise 20 year old daughter said seven words to me that changed my life. What? Me, strong? Could that be true? For the first time in my life I toyed with the idea that maybe I am strong. The voice in my head had always told me that I was dependent and weak. I never questioned those thoughts. But now someone else believed in me and knew I could walk tall and confident no matter what I encountered. Why am I blogging about this? I want you to be aware of the power of your words. The greatest service you can do for your children is to teach them how to memorize positive quotes like the one in the picture. Change the “you” to “I” if you want. “I am braver than I believe. A secret to memorization is in analyzing the words. 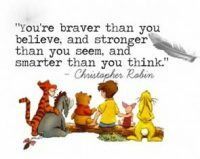 Notice in the first sentence, the key words are “braver and believe”. They both begin with “B”. In the next line, “stronger and seem” begin with “S”. Children need to train their brains to memorize poems, verses or quotes. It is a proven fact that students who memorize, increase the brain’s capacity to remember information. Remember “Use it or lose it!” If you don’t exercise your body, you lose the capacity to function well. If you don’t memorize, the hippocampus loses it’s ability to store and recall information. I have some other inspiring quotes I’ll be sharing soon but in the meantime begin to teach your students and yourself, to memorize!